← Is Sharapova’s “Icy” Rep Melting? Unstrung Reveals Querrey’s Start and Young’s Rise and Fall. In my former life working in marketing for a small documentary distribution company, I visited film festivals across the country now and then trying to find the next great doc. 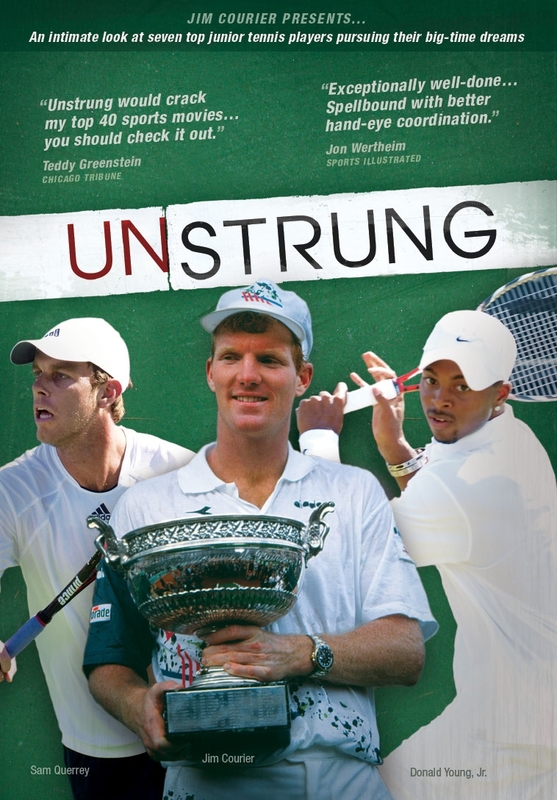 One film that I wanted to see at the 2007 Tribeca Film Festival but didn’t get a chance to was “Unstrung” which looks at the world of junior tennis in America. After its release, I wanted to rent it on DVD but wasn’t able to find it for awhile but I’m happy to say its found a new life and distributor in FilmBuff that offers many films through video on demand. What makes taking a look at “Unstrung” today worthwhile is how it reveals the rise of both Donald Young, who at 15 was considered the next big thing in pro tennis, and Sam Querrey who appears late in the film almost as an afterthought. But the film’s structure and how it plays out is very much how both of Young and Querrey’s careers have done so far. “Unstrung” follows several promising players as they wind their way through the grinding road of junior tennis. Although all hope for a shot at the pros, some are more concerned with immediate monetary gain that eager sponsors can provide while a few see tennis as a path to grow character and discipline before they head into college. Including interviews with John McEnroe, Andre Agassi, Pete Sampras, Jim Courier, and Andy Roddick, the film focuses on both the good and bad sides of junior tennis and does an excellent job giving the viewer an inside look at the less than glamorous side of the game. The film spends a lot of time on Young and rightly so. At the time of production, Young was the No. 1 junior in the world and already signed to a multi-year contract with Nike who probably thought they had the Tiger Woods of tennis on their hands. Young’s mother, Illona, who also serves as his coach, demands only the best from her child, but that’s to be expected considering his potential at the time. Many of the interviews with her and her husband, who own a tennis training facility in Atlanta, have them discussing the pressure of having “the one” and how they are viewed by others in the game because of it. Donald Young Prepares to Return (Gudris). Meanwhile, Querrey’s parents, Mike and Chris Querrey, take almost the opposite approach. Their interviews discuss how their very tall son just took up the game naturally but was never under any pressure to succeed and Querrey himself talks about he could have given up the sport to join the debate team and that would have been fine by everyone. Querrey, with a goofy grin and a relaxed air, saunters into the last third of the film and you get the sense that the filmmakers had to add him in at the last minute. Many documentaries, no matter the subject, are forced to change focus as the story does and “Unstrung” was probably no exception especially when some of the fitter and more experienced players the film followed at the start lose early at the penultimate tournament in Kalamazoo. The film ends with an update around 2008 but you don’t need that to know how things have turned out. Querrey, after turning pro, soon won his first ATP event in Las Vegas and has since climbed into the top 20. Young, though now ranked around 112, has done well on the Challenger circuit but still hasn’t had the breakthrough many expected. It almost makes his father look foolish when at the end of the film he predicts with confidence Young will be No. 1 in the world. 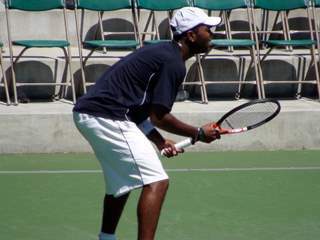 Donald Young At Carson Challenger (Gudris). 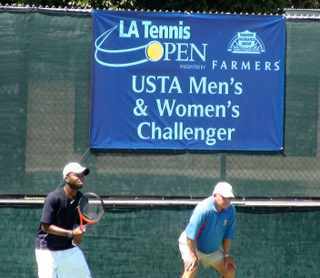 While Querrey was getting media flack for his recent comments at this year’s French Open about being burned out, I saw Young play that same weekend at a Challenger event in Carson, California. Although Young won the tournament, what struck me the most while watching him was the anguish he displayed on court. Many times he would berate himself for missing shots and seemed frustrated with the whole process of actually playing a match. It was a far cry from the quietly confident teenager shown in the film, as if all the expectation placed on him had worn away the innocence of his youth into a bitter twenty year old that has a look of “what the hell am I still doing playing Challengers?” It’s possible Young could still reach another level, but it’s more likely he’ll up being the de facto cautionary tale of how banking on the “one” can be a very expensive mistake. “Unstrung” is a definite must see for any parent, or kid for that matter, dreaming of jumping into the junior circuit but it’s also worth checking out for any tennis fan, especially those who keep wondering why the next great young American talent hasn’t emerged and taken over the world. After seeing “Unstrung”, you’ll see that these kids are trying their best to do just that. Click here to visit FilmBuff’s website. Comments Off on Unstrung Reveals Querrey’s Start and Young’s Rise and Fall.